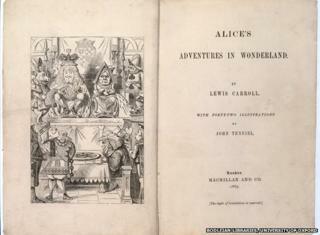 The first edition of Alice's Adventures In Wonderland has gone on display in Oxford to mark the 150th anniversary of the book. The story, written by Oxford University scholar and teacher Charles Dodgson under the pseudonym Lewis Carroll, was first published in June 1865. Experts say the first edition is "immensely rare" as printing was stopped shortly after publication. The exhibition Printing Alice is at the Weston Library in Broad Street, Oxford. The book was first printed in Oxford by the Clarendon Press in June 1865, a Bodleian Libraries spokeswoman said. Dodgson requested 50 copies to be bound early for him to inscribe and send to friends. But a month later, the book's illustrator John Tenniel complained about the "disgraceful" quality of the printing. The edition was suppressed, and Dodgson agreed to have the book reprinted in London. He recalled the copies sent out to his friends and sent them to children's homes. The Bodleian's first edition is one of just 23 of these original copies to survive. It is on display alongside the second and third edition of the book. Bodleian rare books expert Dr Francesca Galligan said: "Seeing the first three editions alongside each other, you can really see what Tenniel didn't like about the printing of the original illustrations and the marked improvements in the 1866 edition." Also featured are fantastical illustrations by Salvador Dali, produced for a special edition of the book. The germ of the story came when Dodgson attended Christ Church College at Oxford to study mathematics in 1851 and struck up a friendship with the children of the then dean, including daughter Alice Liddell. Alice's Day is celebrated on 4 July as, reportedly, on that day in 1862, Dodgson first told the children about the little girl who tumbles down a rabbit hole into a topsy-turvy world called Wonderland. The free exhibition runs until 23 August.